Death penalty or more commonly known as ‘Bitay’ is still one of the most debated topics in the country with President Rodrigo Duterte announcing that he wanted it back. The death penalty was previously implemented in the country during the presidency of former President Marcos back in 1999, but it was soon stopped in 2006. What if I told you that the youngest person to be ever sentenced bitay is just a teenager? Marcial “Baby” Ama was born in Tondo, Manila. He was imprisoned for stealing money and soon gained the nickname “Baby” because of his youthful good looks. Despite being abused during his early days in the prison, he became the leader of a notorious gang- The “Sige Sige” Gang. He gained folk hero status when his biography was turned into a movie named “Bitayin si Baby Ama” in 1976 starring the famous artists Rudy Fernandez and Alma Moreno. As stated in the film, he was apparently incarcerated for stealing money for a friend’s education. He then became a target inside the jail due to his youthful boyish looks and eventually earned the nickname “Baby” thanks to his baby-face. Life became much harder to Ama inside the prison as he was repeatedly sodomized and the final straw was when his pregnant wife was raped and sexually abused by a prison guard. The event took a toll on the couple, and his wife soon committed suicide with their unborn child. The death of his wife became Ama’s breaking point, and that’s when all hell broke loose. He then became a hitman inside the prison while also being the leader of his own prison mob. In 1958, he started the largest and deadliest riot in the history of the New Bilibid Prison in Muntinlupa causing the death of nine inmates, one was even beheaded. 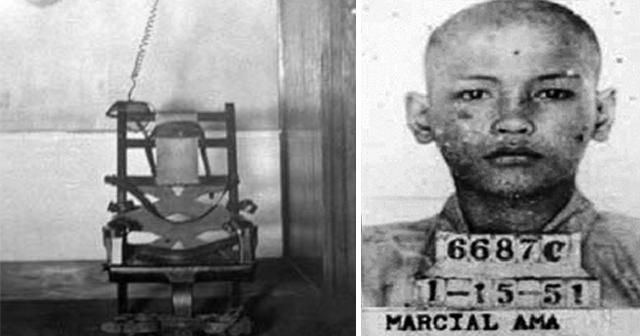 He was then found guilty of stabbing a fellow inmate and was shortly sentenced to death penalty by electric chair on October 4, 1961. Ama’s story proved that he was just another victim of violence at such a young age. And while the new generation may not know him, the earlier generation will surely never forget the one and only Marcial “Baby” Ama.